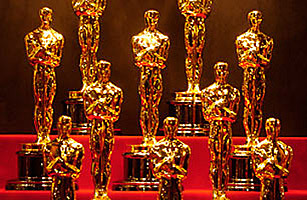 Who Will Go Home with an Oscar? You needn't tune in early to the Oscar show this coming March 7; there'll be no suspense for the Best Supporting Actor and Actress awards. Christoph Waltz is a lock for his role as the sneaky German officer in Inglourious Basterds, and Mo'Nique a sure thing as the mom from hell in Precious. But you might want to watch later on, to see if two Hollywood icons, George Clooney and Meryl Streep, are upstaged in the Best Actor and Actress categories by two lesser-known Brits, Colin Firth and Carey Mulligan. And wouldn't it be a blast if The Hurt Locker, the indie Iraq war drama that not many people saw, were to take Best Picture over the mainstream front-swimmer Up in the Air? Those, at least, are the indications from a tally of 21 groups that have announced prizes for the best films and performances. The critics' choices are often early indicators of the Oscar vibe. And if they're wrong, no big deal. It's not even Christmas yet. December is that most wonderful time of the year, when Santa perches all the little boy and girl critics on his knee and warmly whispers, "You matter." All the other months, we're dog food. But when the winter solstice nears, and movie reviewers convene to vote for their favorites of the year, we suddenly become valuable to the studios. The news stories about the winners provide free publicity for Oscar-yearning pictures, copy for the movie industry's trade ads and balm for its needy ego. The honor roll also gives members of the Academy of Motion Picture Arts & Sciences hints as to which DVDs, of the dozens, hundreds, of recent films they've been sent, should be pulled out of the freebie pile and watched. See, we critics have a higher mission after all. We're the Oscar voters' touts. We're also an additive, or corrective, to the nominations for the Golden Globes. The Hollywood Foreign Press Association, it's always worth saying, is more an annual TV show than a critics' group. Most of them don't review movies at all; they're show-business reporters for foreign papers. As such, they want access to movie stars, and they get it by throwing a dinner for celebrities; the party favors are nationwide attention and maybe an award. To get on their guest list, it helps to be famous; note that The Hurt Locker's Jeremy Renner, who finished third in our critics' tally, was not nominated for a Golden Globe. But we're betting he has an aisle seat on Oscar night. To get a sense of the 2009 critical consensus, I kept tabs on the winners as voted by 21 groups: Austin, Boston, Chicago, DallasFort Worth, Detroit, Florida, Houston, Las Vegas, Los Angeles, the National Board of Review (NBR), the New York Film Critics Circle, the New York Online Critics, Phoenix, San Diego, San Francisco, Satellite Film Critics, Southeastern, St. Louis, Toronto, Utah and Washington, D.C. Not included are the Gotham Awards, which don't divide acting prizes by gender or the size of the role, or the National Society of Film Critics, the one organization I know of that doesn't vote until January. The venerable NBR is not so much a critics' society, more a group of concerned citizens. They're included here because they've anticipated the top Oscar winners the past two years, and because they throw the best awards banquet this side of the Golden Globes. In each category, the winner from each group received one point; if the vote was tied, or two prizes were given, the winners got half a point each. Not all groups vote prizes in every category. And now, with briefest commentary, here are the totals.